Why Don't I Like The Way I Look? During puberty your body goes through a lot of changes. 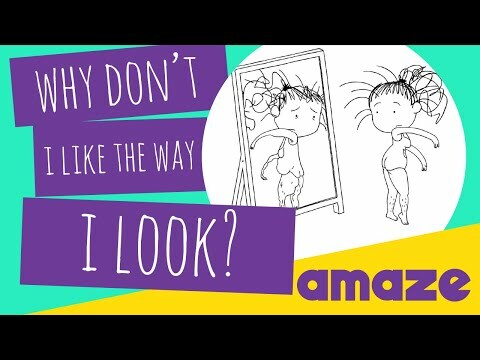 Sometimes this can be overwhelming, and you may notice that you don’t like everything about the way you look all of the time. How you feel about your body is referred to as your body image. Your family, friends and images you see on TV, online and in movies and magazines can also influence how you feel about your body. People of all genders can have positive or negative feelings about different aspects of their bodies. It’s important to know that many of the images we see online, on TV and in magazines are not real. They are created by using computer programs like Photoshop to make a person look more like certain ideal images of beauty, but are unattainable in real life. It is important to remember that everyone is different and that is what makes us all unique! Bodies: Different Shapes and Sizes. All Beautiful! Body image refers to people’s perceptions of, attitudes toward and feelings about their bodies. An individual’s body image is shaped by how their physical features compare with their understanding of ideal images of beauty and attractiveness prevalent in their culture and community. People of all genders can have positive or negative feelings about different aspects of their bodies, including their height, weight, hair and pretty much any other part of their body. Many young people feel great pressure to have their bodies or specific body parts look a certain way; don’t underestimate how much pressure young people feel and how much self-loathing exists. Young people need help understanding that the images of beauty we see online, on TV and in magazines and movies are not real. It’s impossible for anyone to live up to these images that require teams of people to create and manipulate into idealized standards of beauty.